(Newser) – You deserve a break today. No, really, don't get up—a McDonald's server will bring your Big Mac right to you. That was the Thursday announcement from the company's execs, who said the new table-service option they're offering will help transform Mickey Dee's into a "modern, progressive burger company," BuzzFeed reports. 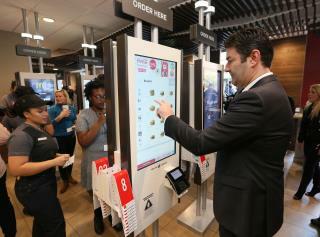 How it will work: Diners who want to eat in will place their order with a regular cashier or via a touchscreen kiosk, then take their numbered Bluetooth-enabled locator to a table of their choice, which a server will track down when their meal is ready. About 500 restaurants already offer the service in Florida, New York, and Southern California, with other locations in San Francisco, Boston, Seattle, Chicago, and DC getting the upgrade early next year, per CNNMoney. It's not clear when the changes would be rolled out to all 14,000 US stores. Now if they can just figure out that making their food taste better would really turn around their sales. McDonald's seems obsessed with changing everything to turn their franchise around except for the actual taste of their food. Who cares if it is unhealthy? That has nothing to do with profitability. This is a stupid idea. What the hell difference does it make if I stand at the counter for 5 minutes and get my food OR sit down and wait 7 minutes until someone brings it to me? Thanks but Ill just stand and wait. Oh goody. Royal treatment at Micky D's. Gag! ? ?